Jam packed with rare omega-7, phytonutrients and vitamins, sea buckthorn is a great aid to healthy heart, brain and mucous membranes. This ancient beauty berry is bursting with antioxidants that can nourish your skin and protect your body from vicious free radicals. Sea buckthorn berries are loaded with unsaturated fatty acids, vitamins and biologically active substances that help boost immunity. The nutritional profile of sea buckthorn berries is as extraordinary as their pungent taste. Used for centuries in Eastern Europe and Asia, this plant is also supercharged with amino acids and dietary minerals. 100% organic dried sea buckthorn berries (Hippophae rhamnoides (L.)). 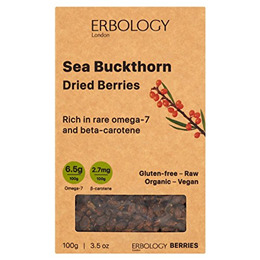 Enjoy the distinctive tart flavour of sea buckthorn berries in porridge, yogurt or salad. 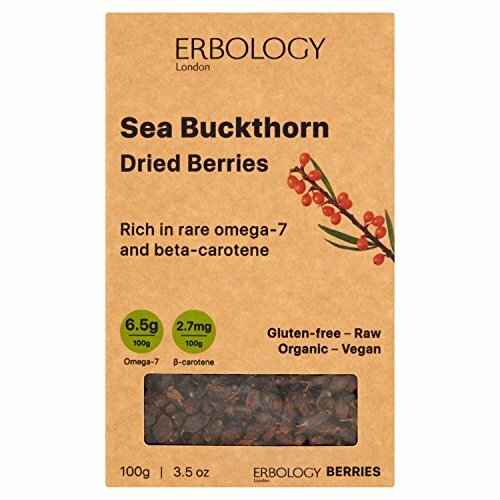 Below are reviews of Erbology Organic Sea Buckthorn Dried Berries - 100g by bodykind customers. If you have tried this product we'd love to hear what you think so please leave a review. Jury is still out. Expensive product but I only use a very small handful in my smoothie which you can't taste with everything else. My purpose for purchase is for menopausal reasons as Omega 7 is supposed to be very good for dryness. Can't really tell yet to be honest so I might write another review at a later stage.